The largest coffeehouse chain of the world is a very distinct story of a beverage brand and a coffee business empire. Founded in 1985, Starbucks has its headquarters in Seattle, USA. The premium coffee brand has expanded fast and is operational across 75 countries. Within its 33 years of life, the company has come to be known for several things apart from the largest range of coffee flavours. A great brand depends on great products and Starbucks has exceptionally good products to offer. Without ever compromising on taste and quality, it has continued to explore stronger options to bring its customers only the best from the world of coffee. However, Starbucks is not just a coffee brand. It is successful because it is a customer centric brand and even with changing industry dynamics, the company has proved itself relentless in terms of its focus on customer service. Behind all this is a great branding strategy that firmly rests on several pillars apart from great production and marketing as well as a well-managed supply chain. Unlike McDonalds whose more than 90% stores are managed and run by franchises, Starbucks has managed an optimized mix of company owned and franchised stores. This business model has proved successful because Starbucks has retained heavy focus on quality in all areas from sourcing to production as well as sales and service. To make a franchisee model successful, you must have excellent quality controls in place. In this article, you will read about the several pillars of the company’s business model and how its strategy has helped it achieve global recognition and success. At the core of Starbucks’ business strategy is quality. It is a premium brand that sells only premium quality products. It is also the main point of differentiation that the brand has adopted. While Starbucks’s business model is differentiated along several other lines as well but whenever a customer thinks Starbucks, it thinks great quality and variety . Starbucks has used this formula since its foundation and never tried to compromise on quality and taste. It charges premium prices for its products and it is mostly the higher end customers that are regular visitors at Starbucks stores. The reason that it can charge premium prices is its quality. The taste and quality offered by Starbucks is nearly irreplaceable and that is why customers are willing to pay extra for better quality. 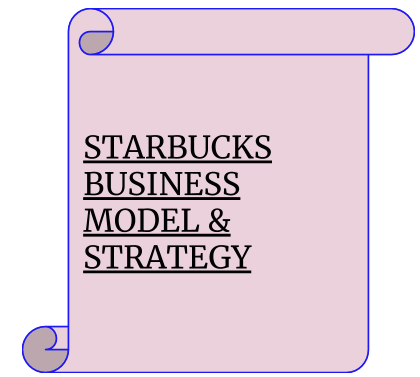 This business model has proved profitable which is clear from the rising revenues of Starbucks. While the Americas account for the largest part of its net revenues and income, the brand has been able to find faster growth in CAP (China and Asia Pacific). Its profits have also continued to rise because of the continuous drop in the wholesale prices of coffee (Investopedia). Part of the credit goes to its well managed supply chain and sourcing strategy. Moreover, its customers do not mind paying the premium prices for what the company offers. The Arabica coffee that the company sources is different form the normal Arabica and Starbucks is also very picky about its beans. Experts taste thousands of cups daily to ensure maximum flavour and highest satisfaction from coffee. So, if you can ensure the highest quality in the industry, you can expect your customers to be willing to pay more. Starbucks has clearly set standards much above the normal and the results are simply great. Whether a regular customer or not, people still appreciate its quality and flavours. In these words, Starbucks has explained some of the most important traits that define its culture. Customers are at the core of its culture and with the level of dedication to customer service visible at Starbucks, one can easily know it is a customer centric culture. Some other critical traits that define Starbucks culture include inclusion, transparency, courage, dignity, respect, integrity and accountability. It is not just about the customers, but the culture at Starbucks is meant to make its employees whom it calls partners feel included. A strong culture is essential for many reasons. A strong culture and shared values keep the entire organization together and help create a environment of trust. It increases the efficiency of the organization and also gives it the strength to take new challenges. Successful organizations work as large teams with a strong central culture that is all pervasive. It brings accountability and on top of all it brings unity which is critical for being competitive and taking the bigger challenges. A strong culture has some other great benefits too. Sometimes, it is the best tool to form strong customer connection. The company is also great in terms of work culture. Well, it is also true that Starbucks derives much of its strength from its employees. To ensure that its employees are satisfied and can deliver their best performance, it has provided them an excellent work environment. Mark Henricks notes in his article for Entrepreneur that the Starbucks story is endlessly fascinating. these people spend just as much time and dollar talking to their employees as much they do on their customers (Henricks, 2007). A large and smart enterprise cannot be run only with a good business strategy but you also need to mind your ethics. Starbucks has shown great performance n this area and the brand has come to be recognized for its efforts in managing its supply chain ethically. A few decades ago when environmental activists were making much fuss about Starbucks exploiting its third world suppliers, the brand took it as a challenge. It started a pilot programme aimed to ensure ethical and sustainable sourcing. The program selected only the farmers (suppliers) who suited the criteria set by Starbucks. These farmers were required to have a good reputation in several areas from product quality to environmental impact and labor. While this has ensured the supply of good quality raw material over all these years, it also made sure that all the raw material the company sourced was bought ethically. Moreover, the farmers that perform best in terms of these criteria are paid extra for their beans. This has also helped Starbucks strengthen its relationships with its suppliers. Last year, the brand celebrated ‘99% ethically sourced coffee’ and plans to reach the target of 100% by the year 2020. This is another area where Starbucks has been able to build a great reputation. Its focus on customer service has helped the brand earn a special place in its customers’ hearts. Customer service was a central area of focus since the foundation of the brand. However, in the recent years, the brand has intensified its focus in this area which has resulted in higher customer loyalty and popularity. It provides its employees special customer service training. Even the baristas are a part of this program and are involved in customer service. They too play an important role in engaging the customers and creating a welcoming and hospitable environment. This has resulted in higher customer satisfaction. In the twenty first century, all the successful brands are the ones that have placed intense focus on customer service and engagement. They cannot be successful without keeping the customer at the centre of the picture. Starbucks has used a balanced mix of company owned and franchised stores. Its strategy in this area is much different from that of another major fast food chain McDonalds. McD has more than 90% of its restaurants run by franchisees. In Starbucks’ case, it has 51% of the restaurants owned and run by the company whereas 49% by the franchisees. This gives the brand higher control on its business model. Its revenue from the company operated stores is also much higher as compared to the licensed stores. The company operated stores generated around 78% of its total revenue in 2017. The number of company operated stores in 2017 in the Americas was 9413 whereas that of licensed stores was 7146. Starbucks has carefully optimized its store mix to generate highest potential revenue. Starbucks has expanded its business to 75 countries. Its main market are the Americas. The Americas accounted for 15.65 Billion dollars of net revenues in 2017. This is around 65% of the total revenue that the brand generated in 2017. However, the brand is also increasing its focus on the other fast growing markets. Starbucks is premium brand and this is the main reason that its customer base is limited and the brand can only grow in reasons where the customers have higher dispensable income. To increase its revenue from the other markets, Starbucks increased its focus on CAP ( China & Asia Pacific). China and India are fast growing markets and also among the most attractive for growth in this era. Starbucks has continued to expand its number of stores in China and Asia Pacific. However, this doesn’t mean the brand is trying to reduce its focus on the Americas. North America still remains at the centre of the picture while Starbucks is trying to expand its business into the fast rising markets. Starbucks has built a distinct identity for itself that is different from any other brand trying to compete with it. A strong identity is based on values. Shared values at Starbucks include integrity, ethics, transparency and accountability. Other factors that have set the brand as a distinct one among the crowd of brands include its focus on quality, ethics and customer service. For past several decades since its foundation, Starbucks has remained a popular brand creating lot of buzz with its flavours and cozy stores. Except for the past few years, Starbucks had never made any financial investment into marketing. However, it always had a clear cut branding strategy which relied on making a long lasting impression on the customers and the market through its flavours, quality and service. In terms of marketing too the brand did not spend on demand creation through ads and promotions earlier. This has changed slightly during the last few years but still Starbucks is far from being as aggressive in terms of marketing as Coca Cola or McDonalds. Its expenditure on marketing and promotions has not crossed even half a billion yet. So how does Starbucks really market itself? Of course it’s the buzz. Its flavours, its excellent store designs and its great culture are the reason it is among some of the most talked of brands. Its website and social media are otherwise sufficient to make the word reach millions. Every great brand that has a great product to offer can build strong recognition and brand awareness easily. It is targeting the premium customer and has created everything that they love from taste to environment. So, there are some strong pillars of its branding strategy that have helped it create stronger impact. Information technology has helped thousands of brands grow faster, find a larger customer base and enter new markets. The power of Information technology is hardly hidden. It is also a major pillar of its business strategy because managing large scale sales is not possible without IT and IT enabled tools and channels. From sales to marketing, in all these areas Starbucks is using IT based tools for maximum efficiency and productivity. Over the past few years, its investment and the use of IT inside the organization has grown manifold. It uses Information Technology Systems for several functions including Point of sales, web and mobile platforms and communication both internal and external. Information technology has become indispensable in this era since it adds speed, efficiency and convenience to tasks. However, IT is also an elephant that requires heavy maintenance. Data breaches can otherwise prove hazardous to the financial health of a brand as well as reputation. The Information systems at Starbucks store a lot of personal data of the customers which must not fall into the wrong hands. Therefore, the company invests a lot in the maintenance and security of its Information System. A lot has been written about Starbucks and its business model. Several books and articles are devoted to exemplary leadership to Howard Schultz, his business strategy and other many excellent things known about Starbucks. One thing is certain and that is Schultz’s business model is successful. Starbucks has been able to generate the best impact through an optimized mix of company owned and licensed stores. A unified culture is also a very important strength of this business model. However, underlying all these strengths is simplicity and ethics. These are the most important bricks in Starbucks’ foundation and also the most important reason that the brand has generated strong recognition in the world market. Despite being a premium brand Starbucks is a favourite of millions. Supply chain is also a very strong and important pillar of its business model. The company has strengthened this pillar a lot during the past few decades. This has come through single minded focus on quality, environmental practices and ethics. The Starbucks model has proved that to find greatness, you must remain willing to make a few sacrifices.